Firebase is returning to the Game Developers Conference this year in San Francisco to share how we’re making Firebase even more powerful for game developers! In case you missed these announcements on stage, read on below for a quick recap. We’ll also be at booth #P1501 starting tomorrow until the end of the week, and have a special session on Firebase for Games in the Cloud Developer Day track, so if you’re at the GDC this year, please come say hello! We’re excited to get your feedback, and learn more about how we can make these features and Firebase for Games even better in the future. Firebase Crashlytics is now available for Unity! Firebase Crashlytics helps you track, prioritize, and fix stability issues in real time. It synthesizes an avalanche of crashes into a manageable list of issues, provides contextual information, and highlights the severity and prevalence of crashes so you can pinpoint the root cause faster. You can also easily reproduce issues by reviewing breadcrumbs, a list of actions that the user performed before the error occurred. Crashlytics was previously only available for Android and iOS, but you can now use that same powerful crash-reporting functionality in your Unity games! With the same simplicity of all our Firebase for Unity SDKs, Crashlytics can be integrated directly via your Unity IDE with no extra steps required. 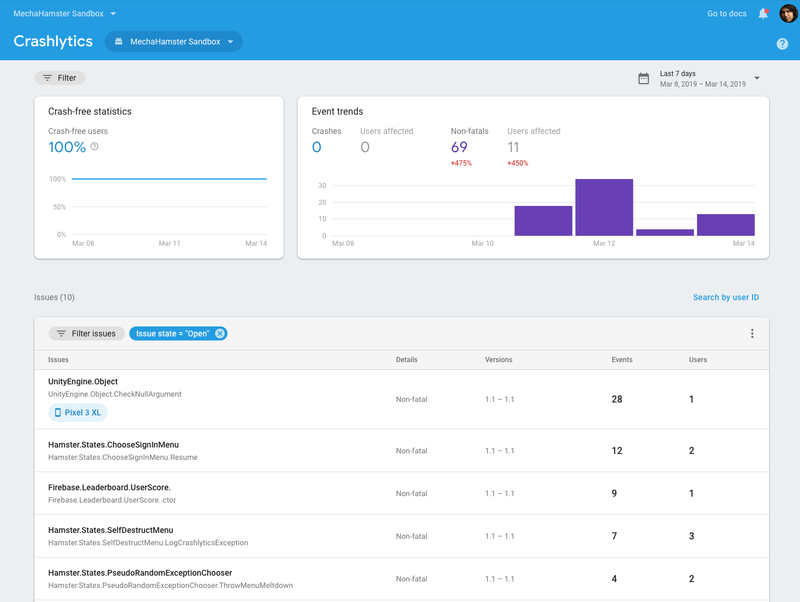 Your team can also be alerted of issues using our Email, Slack, Jira and PagerDuty Integrations, or write your own triggers using Cloud Functions with Firebase Crashlytics triggers. After you export your Crashlytics data to BigQuery, you will be able to see the distribution of crashes by level 3, or any other level or custom key you’ve used for your events! And you can use our Data Studio template to quickly analyze this data. This will make tracking and fixing issues in your Unity game development a whole lot easier. Refer to our documentation to get started with Firebase Crashlytics for Unity. For C++ developers out there, you can now use an open source SDK for your Firebase for Games integration! This means more control than ever when integrating with the Firebase toolset. You can now easily dig into the code to see or change what’s happening within the SDK to better suit your game, or maintain your own branch of the client SDK and cherry pick specific changes you care about. And if there are other platforms you want to use that we haven’t yet built support for, you have the option to extend the SDK. Firebase Test Lab is a cloud-based app-testing infrastructure. With one operation, you can test your Android or iOS app across a wide variety of devices and device configurations, and see the results in the Firebase console. For native Android apps, what are called Robo tests can intelligently analyze the UI elements on-screen and crawl through them. For games, however, this isn’t possible because all of your elements are typically in a GL/Vulkan/Metal View. Instead Robo will resort to Monkey Actions, where it will tap randomly. Monkey Actions without AI assistance starting a game. AI-assisted Monkey Actions starting a game. Firebase Authentication provides an end-to-end identity solution for your app, which allows you to authenticate and verify users with passwords, phone numbers and popular federated identity providers like Google, Facebook and Twitter. For iOS games developers, we are pleased to announce that Firebase Authentication now also supports Game Center Authentication, so if an iOS user is already signed into Game Center, they can also sign-in to your app without having to go through an additional sign-in flow. Come chat with us to learn more! We’ll be at booth #P1501 all throughout the conference starting from March 20th – March 22nd, and have a special presentation on the Cloud Developer Day track on Wednesday at 5:00PM! We hope to see you there.